Skyscraper could’ve been the greatest action movie parody ever made. Instead, it’s just stupid. Skyscraper exists for one scene and one scene alone. It’s when Will Sawyer scales a 100-story construction crane in an effort to leap into a towering inferno and rescue his family. Who the heck is Will Sawyer? Well, he’s played by Dwayne Johnson (Jumanji). So that — virtually by default — means he’s a former FBI agent (or select whichever preferred branch of military or government agency) with mad survival skills, a heart of gold and an intelligence level exponential to his enormous chest size. Will Sawyer is, in short, a typical Dwayne Johnson character. Well, wait a minute. He’s also an amputee. That’s a new facet. The movie sets the stage with a massive stakeout on a cabin in Minnesota. The armed forces present to handle what seems to be a really (really) serious domestic issue is substantial. It’s practically on par with the Osama Bin-Laden raid. As it turns out, the subject of the stakeout is a distraught family man — none of the particulars of his predicament are revealed. Things go South and Will winds up in the hospital, where he’s operated on by the woman who will become his wife and the mother of his two adorable and impossibly well-behaved children. His wife, Sarah? That’s Neve Campbell (Scream). It’s so good to see her back on the big screen in a high-profile movie. It’s unfortunate it’s not a better movie, though. Anyway, Will loses his left leg below the knee, but — 10 years after the cabin disaster — he still never misses a beat, nonetheless. Not during living room brawls, not while running down the mean streets of Hong Kong and not while storming up that crane. There are setups along the way. Surely that artificial leg is going to factor into the action. And it surely does. A few times. Culminating in a “coulda called that one several thousand feet down” high-stakes, high-altitude problem of Will’s own making. Why does Sarah have such a recurring problem with her iPhone? There’s a payoff for that. Why does this glitzy, 220-floor super-tall, $6.5 billion luxury apartment complex in the heart of Hong Kong include an iconic sphere at its tippy-top — one that features hundreds of high-definition screens that rise out of the floor? There’s a payoff for that. Why does someone want to see the tower burn down in the first place? Well, there’s a whole subplot around that and once the story bucks up, the reveal is disappointing. It’s really disappointing. And it all revolves around one thing. The characters can talk about “powerful crime syndicates” all day and all night, but it’ll take more affectation than a Scandinavian accent buffered by artillery to make a truly evil foil to Will Sawyer. Kores is just a meanie who needs a smack upside the head with an artificial limb. He’s no Hans Gruber. And neither is Mr. Pierce (Noah Taylor, Lara Croft: Tomb Raider). He’s merely an annoying crank from his introduction to his demise. As the movie runs through the action in a little more than 90 minutes (it feels longer), there are moments of high-rise peril that send a bit of a tingle down the spines of heights-fearing viewers. But then there’s the reliance on duct tape and rope. That’s when the movie gets funny and there’s a glimpse of what might’ve been. 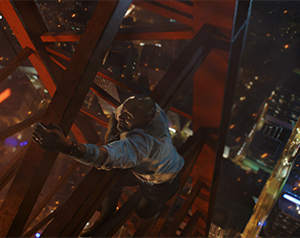 “This is stupid,” Will comments while on the edge of the skyscraper. Yeah. That sums it up well. But it could’ve been stupid fun. Some of the scenes of family endangerment are abysmally absurd — such as a ludicrous rescue sequence involving lots of flames, a terrified kid, a heroic mom (she can take lives and save lives with equal aplomb) and Will’s huge pecs. And it’s all played as straight-up action. Put it in this perspective. Writer/director Rawson Marshall Thurber collaborated with Dwayne Johnson before, on the action-comedy Central Intelligence. But, more importantly, Thurber wrote and directed Dodgeball, a masterwork of stupid comedy. As the end credits roll, the realization sets in Skyscraper would’ve worked much better as a parody than a modern-day iteration of the old Irwin Allen disaster movies or Die Hard (celebrating its 30th anniversary this year, by the way). And even though there were moments of engaging peril, that sensation wears off quickly. Ultimately, what should’ve been the movie’s greatest hits were merely grazes.